I thought I'd give you a little food for thought to start the week. Dealing with criticism is tough, but in my chosen career it's something that comes with the territory. (In fact, I wrote a post about it awhile back that you can check out here.) I've gotten better at handling criticism over the years, mostly by trying to view all criticism as constructive -- even when it isn't meant to be. 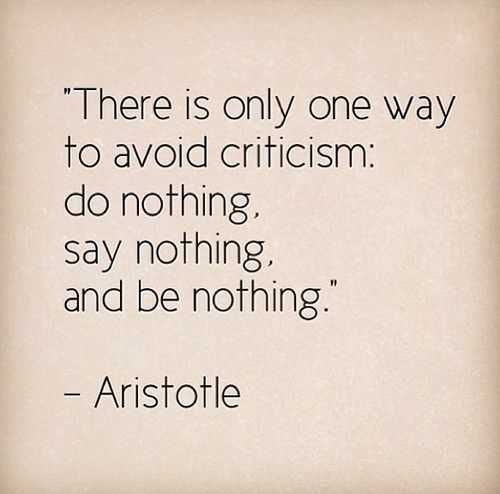 I try to look at criticism as an opportunity to be better, even if it's just being the bigger person. Happy Monday! Hope you all have a great week! P.S. I also wanted to take this opportunity to give you all an update on my mom. She recently had surgery to remove a lymph node and it came back negative for cancer, meaning she is officially cancer free!